The E-ELT Design Reference Science Plan (DRSP) is a collection of science cases provided directly by the future users of the E-ELT. The DRSP aimed at exploring the full range of science cases for which the E-ELT will be used. 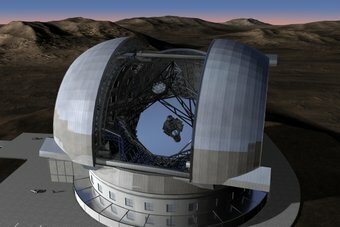 It has helped to define the boundaries of the parameter space over which the E-ELT will operate, and it being used to guide the performance optimisation of the telescope, the prioritisation of the instruments, as well as to plan the science operations modes. The DRSP differs fundamentally from the Design Reference Mission (DRM). The DRM focusses on a few selected, prominent science cases that are being simulated in detail (partly end-to-end) in order to better understand the observatory's performance for these key science areas, and to assist critical design decisions. The DRSP, in contrast, does not attempt to detail the individual science cases, but rather explores the broad spectrum of science planned at the E-ELT by the community. Please see the final DRSP Report for full details. Thanks to the formidable effort of our astronomical community, we have collected nearly 200 DRSP cases. The project is very grateful to all PIs and Co-Is for their many and excellent contributions. The final DRSP Report provides a comprehensive description of the DRSP. In particular it includes an account of how the DRSP cases were collected from the community, a statistical analysis of the information provided, as well as the full, original DRSP submissions (only where the authors agreed to the publication of their submission).